It will be made with Sketchup and printing on our final board! We are currently in the process of making it 3D! Today, my project partner and I decided on our final LPCHS layout for our product! So exciting! We also created the script for our 20% TED Talk. We have yet to create a slideshow or put our final design into SketchUp. It will look really cool. Looking forward to it! Welcome to my first blog post! 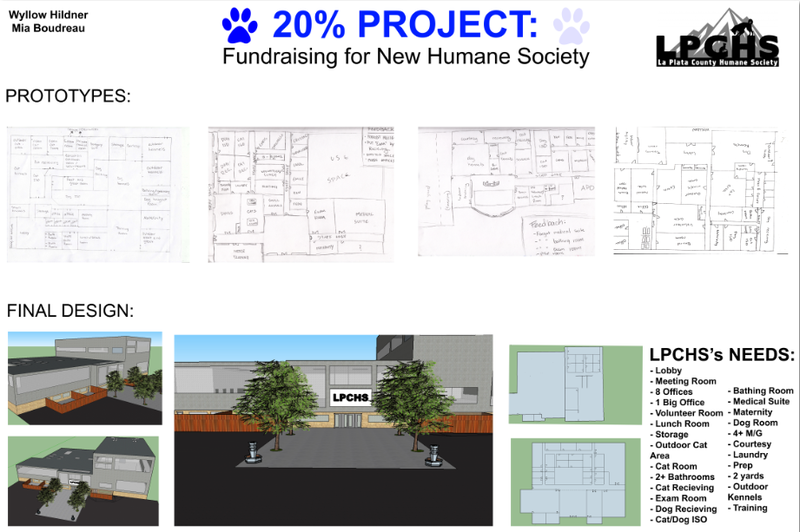 In the beginning of the 20% project, I had the idea of working on marketing for the La Plata County Humane Society. You can find my original project proposal below. As I presented my project to the class, Stephen noticed identical attributes between mine and another classmate's project. He told us to consider collaborating on a single project. Both of our projects were attempting to solve the problem of stressed animals in the humane society. We thought on a larger scale of why these animals are stressed and we figured that it was majorly due to the facility! Our project, then, came to be raising money for LPCHS's new building! Our final product will be a building layout for the new animal shelter. Currently, we have raised $440.00. We have used the sources of GoFundMe and a huge bake sale. We have also talked with potential sponsors and are awaiting a final decision.